" Happy Elloween 2007 " designed by Gary Fletcher for Ellowyne. 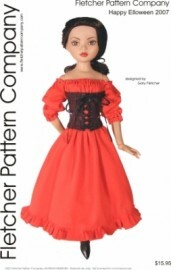 Ellowyne is ready for Halloween with her peasant or wench dress and corset. Dress feature dropped shoulders with draw string waist, bust and sleeves. The lace up corset features eyelet and ribbon closure. This is a very fun ensemble and is quite simple to construct despite it's very bold presentation. The PDF version prints on A4 and 8 1/2 x 14 legal size paper.